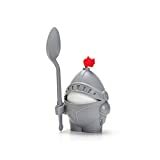 Make your breakfast a bit more medievally whimsical when you serve up a soft-boiled egg inside this cool new Arthur - Suit of Armor Egg Cup. 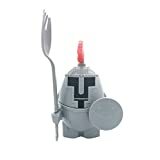 This cute little suit of armor for knighted eggs holds a serving spoon that obviously doubles as a sword when it must defend itself from monstrous scrambled egg blobs. The perfect egg serving cup for kids or anyone who needs a good laugh in the morning.